Very common in the early 19th century in Japan. It was eclipsed by the Shusaku Fuseki from the 1850's on. It is highlighted in game 5 of Appreciating Famous Games. Black most often has continued with a shimari at a or b. There are a few games with the players cycling all the way around the board again making shimari in all the corners. 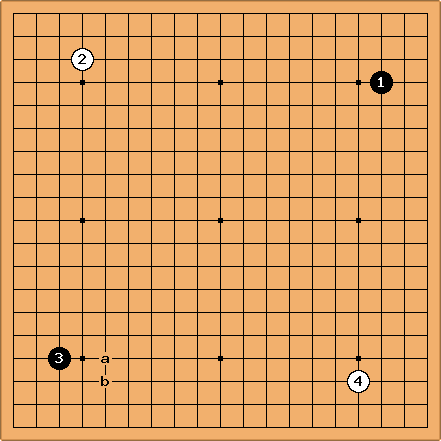 However, more typically one side or the other (especially White in no-komi Go and Black in komi Go) avoids continued symmetry by approaching one of the opponent's corners. Jan: Why is this called 'regulation fuseki'? Was this some kind of prescribed opening?? Dave: Not prescribed the way that old Chinese games began with diagonal hoshi. Rather it was just so common for a while that it earned a nickname. Bill: Ishida discusses this opening in a book I have lost. :-( It dates from the beginning of fuseki theory. IIRC, he said it was called the go shape. Below is what I recall from that book. would stake out a corner, would challenge for it, preventing an enclosure, and would pincer, preventing an extension. Then White would tenuki and open up another corner. The corresponding enclosure for White was better for her, too, as this joseki illustrates. So White, instead of mixing it up right away, prepared for the kakari by playing on the 3-4 point in the adjacent corner that threatened the good enclosure while preventing Black from making it. What's good for the goose is good for the gander. Black did likewise in the lower left corner, and finally, White followed suit in the lower right corner, and the regulation fuseki was born. P. S. Another thing behind this pattern was the realization that the other 3-4 point in the top left was problematic for White. Up to the position is even, but , combining extension and pincer, is too good for Black. See opposing 3-4 points.